If you came to my house, you would understand my obsession with black and white. Here are some of my favorite black and white inspirations. black frame, ikea. black and white bedroom, brocadehome.com via kaboodle. 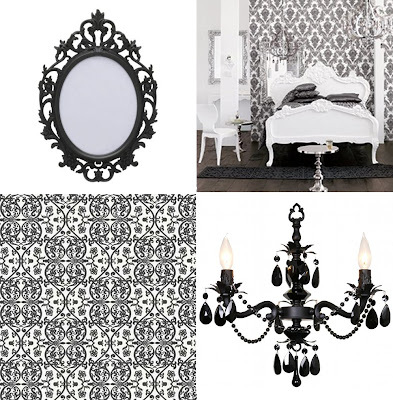 Grace White and Black floral damask retro modern wallpaper, designyourwall.com. black chandelier, tablefivedesigns.com. oh I have way too much black and white in my house! ha.